In October 1986, the above appeared in New Hibernia magazine. 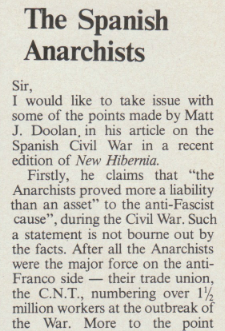 Written by well known Cork anarchist Kevin Doyle, it was in reply to a letter from another Corkman, Matt J Doolan. Doolan was a Blueshirt who had fought for Franco, with O’Duffy’s Irish Brigade, in the Spanish Civil War. His letter can be read here.